DUBAI – A photo exhibition aimed to raise awareness about world hunger opens today at the Dubai International Financial Centre to mark this year’s World Food Day. 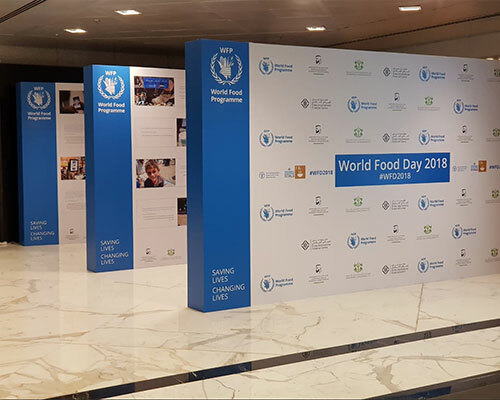 Created by the United Nations World Food Programme (WFP) in collaboration with the Dubai’s International Humanitarian City (IHC), the exhibit is debuting as 821 million people around the globe – one in nine – go to bed hungry. The UAE is at the forefront of humanitarian assistance and is a long-time supporter of WFP. The International Humanitarian City, chaired by Her Royal Highness Princess Haya Bint Al Hussein, hosts WFP’s warehousing facilities in Dubai and is WFP’s largest humanitarian logistics hub. Thanks to the UAE’s generous support, WFP has been able to reach millions of people with food assistance in places like Syria, Bangladesh and Yemen. “Today, with the vast need of humanitarian aid around the world, we cannot sit idly by. In line with the vision and engagement of UAE leadership to make the world a better place, IHC is committed to facilitating emergency response. We are also committed to supporting WFP and all the international humanitarian community to achieve the sustainable development goals and end hunger” said CEO of IHC, Giuseppe Saba. The Dubai International Financial Centre (DIFC) is the leading financial hub for the Middle East, Africa and South Asia. A key focus of DIFC is the advancement of financial inclusion in the region by fostering financial innovation. For WFP, financial inclusion, such as access to savings, credit and insurance, is key to improving food security of the most vulnerable. Arif Amiri, CEO for DIFC Authority said: ‘We are pleased to be hosting the World Food Programme’s exhibition as part of our commitment to addressing the UN’s Sustainable Development Goals, which includes eliminating hunger. Beyond this goal, a number of others are relevant to DIFC and we a driving force for them, especially those relating to industry, innovation and infrastructure; work and economic growth; building sustainable cities and communities; and developing quality education”.